All I can say is WOW... I've never seen so many sharks in one place at the same time and even though I thought I was watching CGI, the actual fact of the matter is that a place like this really exists. Located in the remote corner of the South Pacific which parallels the Galapagos, for sharks, this place is like their own private Great Barrier Reef that is filled with coral and an abundant amount of fish. This documentary explores this place with Dr. Enric Sala and and Explorer-in-Residence Mike Fay who attempt to unlock the secrets of this place from its majestic wonder to its scientific secrets. More specifically, how to save this place from humans, the ultimate predators and mankind's ridiculous hunting of shark for their fins. Joining Sala is a group of experts as they gather evidence in order to petition the government of this region to turn it into a national park. Journey to Shark Eden begins with the team arriving on Flint Island after a vigorous journey by ship which was 38 hours. The movie goes into good depth of how these islands were formed and why it has become a wildlife wonderland. From corals to fish and the greatest predators in the ocean, sharks... this film also highlights the dangers of the divers who are attempting to research this untouched Mecca. The documentary does one Hollywood technique and saves the best for last as they slowly build to the crescendo of the amazing different species of sharks living in this amazing world. It's a well presented documentary that ensures it can be watched by people of all ages and education levels. Another great National Geographic release. The audio of this release supports Dolby Digital 2.0 which is crystal clear and has an interesting and immersive soundtrack. The video quality is stunning which boasts 16:9 widescreen with exceptionally vibrant colours, sharp images and some amazing cinematography. To compliment this documentary, there is a bonus feature called Ultimate Shark that looks at sharks throughout the ages and how these creatures have become the perfect hunters. Using expert interviews, CGI and even discussions with shark survivors, it's a great study of these ultimate predators which more often than not, do not purposely hunt man. Needless to say, it's quite an interesting look into how one of the world's oldest creatures have managed to survive millions of years and only now, is threatened by real extinction. One scene is quite memorable as they capture a great white to study it and then all the scientists attempt to free it after it has been tagged. Just be warned, this special feature is a little gory in terms of shark autopsies and their bloody atacks. 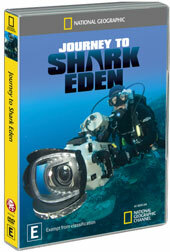 If you're interested in wildlife and more specifically sharks, than this is a must have documentary for your collection. In the end, white sharks are not the dumb animals that they have been dubbed and once again not the enemies that we have unceremoniously dubbed them.